The most common vegetation type in southwestern Wisconsin was the oak savanna, characterized by large scattered oaks interspersed with prairie grasses and forbs. This attractive landscape fascinated early explorers and settlers, who had seen nothing like it in eastern U.S. Because the oaks were so scattered, their lower branches were not shaded, permitting them to continue growing. These oaks are potentially long-lived, retaining their large lower branches as long as they are growing in the open sun. The tell-tale sign of a former oak savanna today is the presence of trees with the characteristic open-grown character. Once one realizes what an open-grown oak looks like, it is easy to spot them, even if they are now embedded in a dense forest. It is only a brief walk through the gate and up the hill from the Picnic Point parking area to reach an area with lots of open-grown oaks. In the photo here, taken last Sunday, four or five open-grown oaks can be seen. There are also more on the opposite side of the road. Five open-grown oaks can be seen in this photo. They are recognized by the presence of large lower branches, or knobs where branches once grew. Unfortunately, the oak closest in the photo has lost many of its large lower branches. Only their stubs remain. All these open-grown oaks are surrounded by a dense grove of of smaller trees, not oaks but maples and other so-called mesophytic species. What did this area look like when these trees were out in the open? 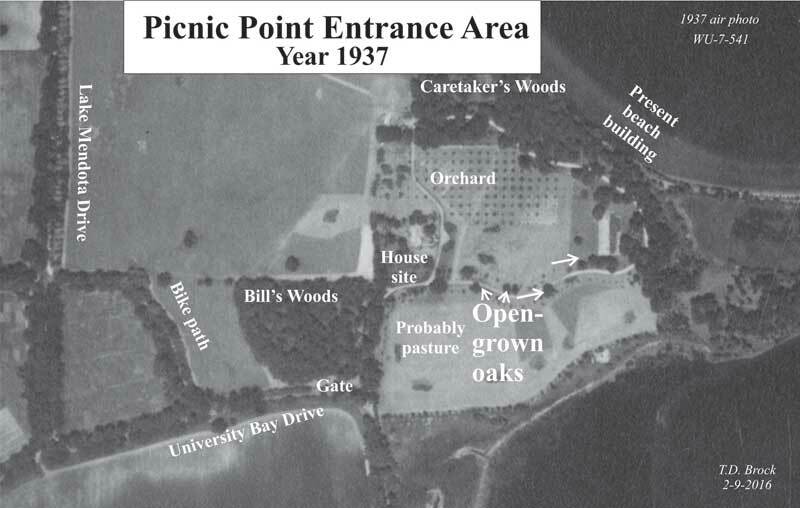 It is easy to tell what the area was like about 80 years ago (when Picnic Point was still in private ownership) because we have air photos from 1937 (taken by the U.S. Soil Conservation Service). 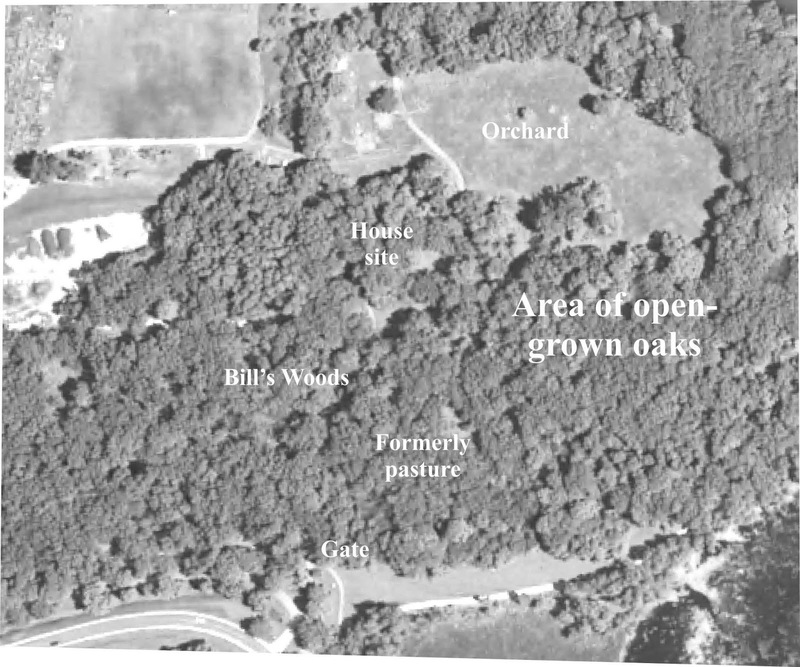 The first photo below shows the area where the open-grown oaks are now found, and the second photo shows a wider view to put the area in geographic perspective. The open-grown oaks are obvious. With high-accurate GIS measurements, one could probably relate the trees in the air photo to those still present at the site. In comparison, the photo below shows the same area in 2010, about 73 years later. In addition to comparing the 1937 and 2010 photos, I have examined air photos for other dates in between. The open characteristic of the 1937 landscape gradually filled in with woods and other woody vegetation. Bill’s Woods, which was a “real” woods in 1937, remained mostly the same, but the savanna area, where the open-grown oaks were so noticeable, gradually became wooded. 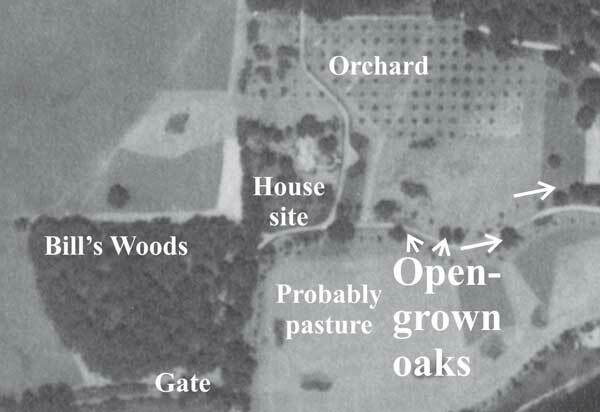 In 1990, the open-grown oaks still stood out, probably because the invading woody vegetation had not “topped out” yet. But in the 2010 photo it is not possible to see where the open-grown oaks were, or even see where the lane ran, because the woods is dense. Before 1937, what kept the savanna open, and why did it then close in? The standard explanation, which is undoubtedly correct, is the absence of fire since 1937. Almost certainly this area, as well as most of Picnic Point, was subject to occasional fire, perhaps annual. It is well established that “farmers burned their woods”, generally annually, in order to promote “green-up” of the pasture. There is a clear fence-line at the bottom of the hill starting at the gate area. We also know from historic photos that cows were pastured on Picnic Point, and there is one photo in this exact area that shows a cow. In 1937 the ownership was in the hands of the Young family, which we know from oral history rode their horses on the Picnic Point lanes. These fields, close to the Young house site, would have been an ideal location for horses. It seems reasonable that there has probably been no fire at Picnic Point since the university acquired the property. What about the present open-grown oaks? These could be rehabilitated, even without fire, by careful clearing of the understory woody vegetation. This is what has been done to two handsome open-grown oaks in the Frautschi Point area. (A trail from the Frautschi Point parking lot reaches these two oaks.) This sort of clearing is often called “daylighting the oaks”. Bringing in more light to their large lower branches is a very beneficial thing, and in many cases can “save” a handsome specimen. That would be my recommendation for all the open-grown oaks at the Picnic Point Entrance Area. Incidentally, these oaks are easier to see now than they will be in summer, when all their surrounding trees have greened up. It’s only a short walk up from the Gate, and well worth the visit! Mineral Point Road, from Gammon Road west to the Beltline, travels through one of the most heavily commercial areas in Madison. Which is why it is so startling to see, at the corner of High Point Road, a large grove of bur oaks. I have been intrigued by this grove for many years and have now found time to look into their origin. Photo looking across High Point Road toward Mineral Point Road. There are about a dozen large bur oaks here. Realizing that such a grove hinted at oak savanna, I accessed the original surveyor's records for this area. Sure enough, this is a classic bur oak savanna, as the surveyor’s notes indicate. The statement mentioning “grass” in the undergrowth shows that this was a fairly open savanna, since prairie grass does not compete under too much shade. 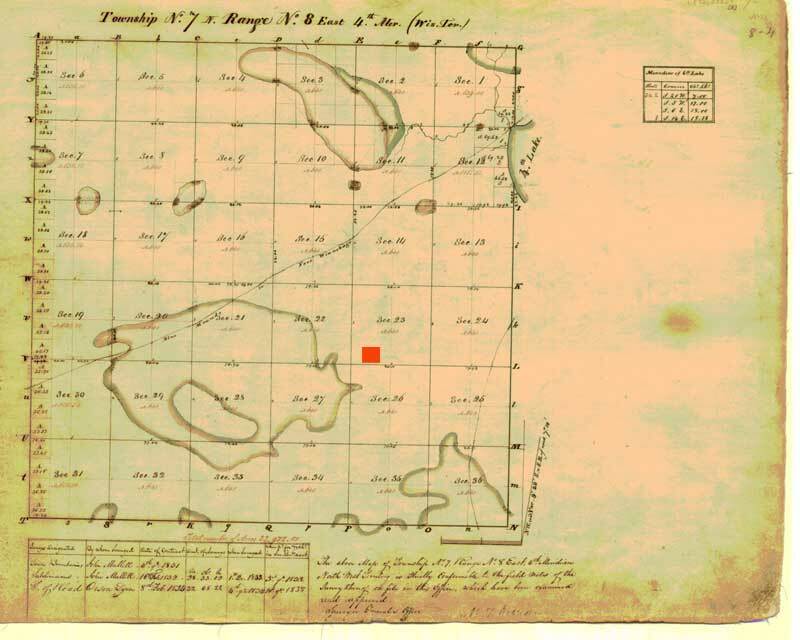 Surveyor's original plat map of the Town of Middleton, showing the location of the bur oak grove (red rectangle added). The extensive prairies are shown by the surveyor's sketches. Air photo of Section 23. Mineral Point Road is the horizontal white line across the lower part of the photo. The bur oak grove is clearly visible. Note in the surveyor's plat map that farther west there are areas that were mostly prairie. 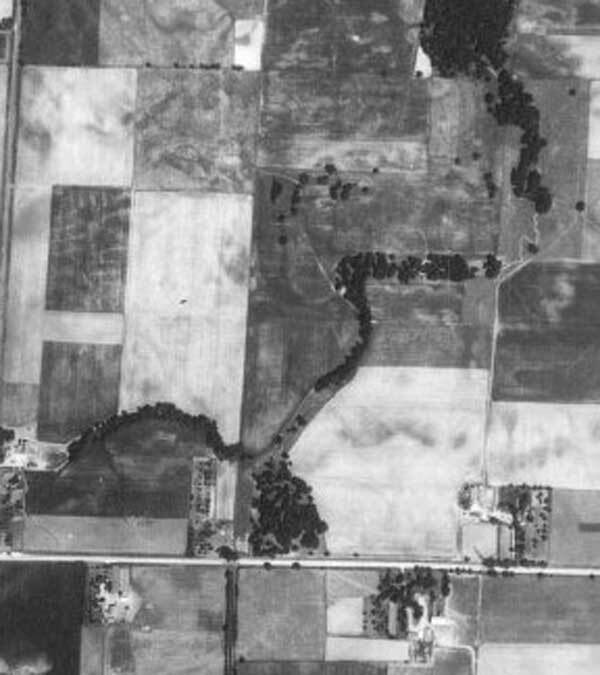 The high plain west of where the Beltline runs today was a large prairie, almost 3,000 acres in extent. Using current landmarks, this prairie encompassed: UW West Ag Expt Station; Junction Road overpass; Pleasant View Road; Elderberry Road; Pioneer Road; West Middleton Church; West Middleton School; Kwik Trip; Tumbledown Golf Course; Point Road; Valley View Road; Sugar Maple Lane; and Point Six Movie Theater. Airport Road now runs through what was once the large prairie shown at the north end of the map. There is also other large prairies in the adjacent Town of Cross Plains, extending east, north, and south from Pine Bluff junction. The surveyor’s plat map also shows a trail from Blue Mounds to Portage that goes across the middle of the Town and around the west end of Lake Mendota (called 4th Lake on the map). 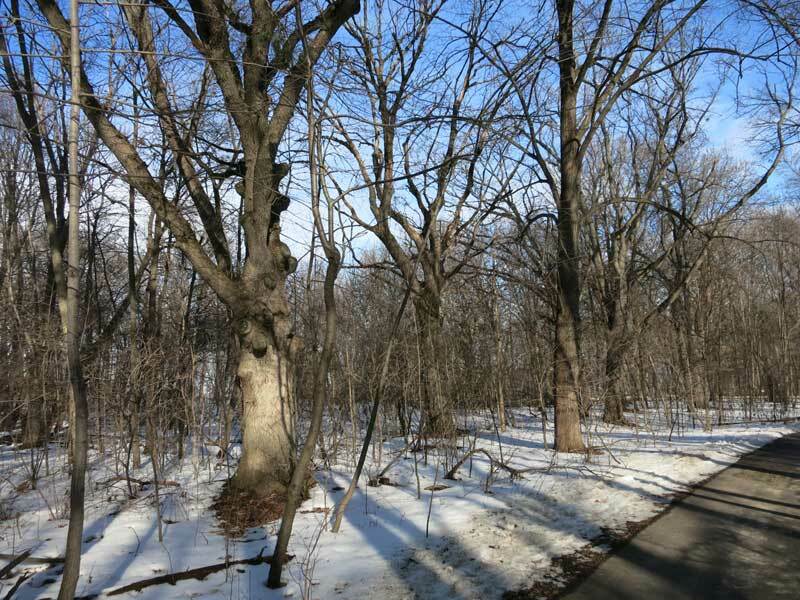 This trail later became a local branch of the famed Military Road that ran between Galena, Illinois and Green Bay. What happened to all this prairie and savanna? By 1890, (the oldest plat map I looked at) the whole of Middleton Township was agricultural. There was an East Middleton P.O. at the junction of Mineral Point Road and County M (now called Junction Road) and a West Middleton P.O. at the corner of Pioneer Road and Mineral Point Road. There was no indication in the 1890 plat map of the presence of prairie. This brief history is instructive. It shows how easy prairies are to destroy. Savannas are also destroyable, but with more difficulty. Especially in the early days of settlement, when only horse-drawn equipment was available, trees were harder to eliminate. But by the 1970s, anything was possible. 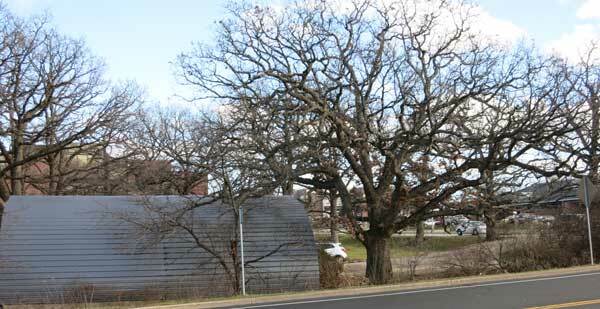 The small bur oak relic at Mineral Point/High Point provides us a tiny glimpse of what this area once looked like!